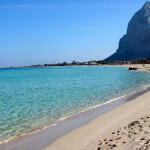 Among the many places to visit in Sicily that we still haven’t visited yet, we chose Marsala and the Egadi Islands. So we went out for a weekend to discover this corner of Sicily and its ancient history that begins from the Phoenician Colony of Mothia. Marsala, from the Arabic name Marsa-Allah port of God, located on the western end of Sicily, was built on the ancient city originally founded by the Carthaginians exiles escaped from Mothia with the name of Lilybaeum. After a quick search of hotel accommodation on specialized websites, we found a bed and breakfast in the center of Marsala. 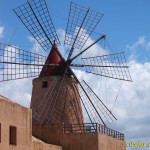 After a long drive we arrived in Marsala in the early afternoon and took possession of our rooms. Just the time to unpack your bags we immediately headed to the port to buy the tickets for Favignana but unfortunately they were sold out so we had to defer to next day. Once purchased the tickets, we went to discover of the city center, just in time to see the streets filled up with people looking for a place to dine like us or simply walking along the streets of the city. As we didn’t have a reservation for dinner we went looking for a place to dine till we stopped at one of many restaurants in the historic center. After a quick consultation of the menu we took without hesitation a fish couscous, an Arab dish which became part of the tradition of this part of Sicily, and at the same time one of the dishes that best represents the unique mix of culture and habits that characterizes Sicily. After dinner there is nothing better than a good walk in the historic center during which we couldn’t help but notice that all the shops were open with an exceptional offer of every kind of goods, for all tastes and for all budgets from the simple Arancina, kumquat, or as they call it in these parts of Sicily, restaurants offering dozens of dishes based on fish. Since our trip to Favignana is delayed of 24 hours, in the morning after we drove North to the islands of the Stagnone and the beaches of Marausa. The Stagnone, characterized by shallow water between one and two meters, is a small archipelago of islands that are part of the Egadi collected in a lagoon limited between the Sicilian Coast and the big island in the middle with the island of San Pantaleo, in which stood the ancient Phoenician Colony of Mothia. After a short warm-up lap in the dock and the windmill still active around which still work the workers of salt, we decide to get tickets for the mini cruise around the island of San Pantaleo which is very interesting as it allowed us to better understand the Stagnone and its ancient history. 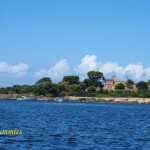 The water across the lagoon is very low but we also discovered the route of an ancient Phoenician road of about 10 meters width that connected with a path of 2 km Mothia to the mainland, now submerged under 50 cm of water but still visible. After returning from our tour after taking some food for lunch we headed to the nearby beach Marausa where we decide to spend the afternoon promising to return to the Stagnone in time to watch the sunset over the lagoon. Here with a bit of luck you can admire spectacular sunsets but unfortunately some clouds ruined the show, but that’s the beauty of hunting for sunsets. To be present when all the elements that make the perfect sunset coincide is hard but very satisfying. Coming back to Marsala we left the car next to our B & B and after a short walk we went back to the same restaurant of the night before with the intention to try busiate, fresh pasta typical of the Trapani Province. In particular we were intrigued by busiate with tuna sauce, raisins and pine nuts but also try by the busiate with swordfish and cheese cream. Early in the morning we took the hydrofoil to Favignana that we reached after a short crossing. Once arrived we just took a tour of the town where we can not help but notice the many rental agencies where you can rent a vehicle to get around the island. So we decided to rent bicycles with which we headed straight for one of the most beautiful beaches, Cala Azzurra. For lunch time we took something to eat in a kiosk nearby and we went to the Bue Marino, one of the most evocative descents to the Sea of the Island, through the typical landscape characterized by the clay pits. 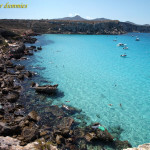 But you can not go to Favignana without visiting one of the most beautiful coves, the Cala Rossa. It is certainly also the most popular, hence the color is crystal clear turquoise water so much that it is hard to understand why it was called Cala Rossa. if you do not know the history, it was called so because of the blood shed by the Carthaginians, defeated by the Romans during the First Punic War in 241 BC. We returned to Marsala in the evening. Our short break comes to an end, the day we came back home but not before stopping to one of the historic wine cellars of Marsala to take a few bottles to take home as a souvenir. Tourist Map the interactive map for the promotion of tourism in Sicily always at your fingertips, finding a place has never been easier.